By 1880, London docks were a hub for world trade. Until the outbreak of the Second World War, the sheds and warehouses that lined the river Thames housed every conceivable commodity. In 1889, the port of London was paralysed by a huge strike by the dockworkers. 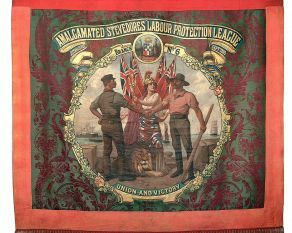 This banner commemorates the victory of the 100,000 striking stevedores - a milestone in labour history. 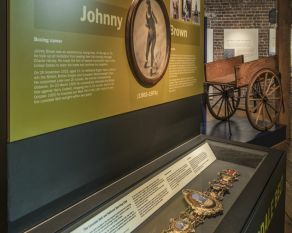 This golden Lonsdale Belt was won by bantamweight boxing champion Johnny Brown, a working-class sporting hero who grew up and lived in London's East End. 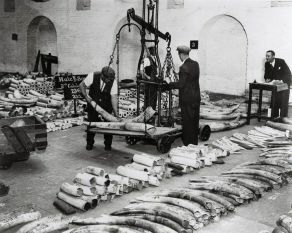 Elephant tusks, here being loaded into a London warehouse, were just one of the thousands of rare cargoes imported by the docks. © PLA collection. 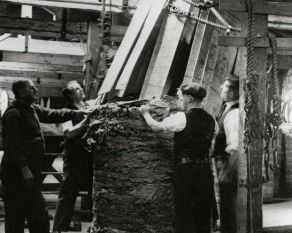 This image shows the wooden staves being removed from a hogshead of tobacco before it was weighed. Royal Victoria Dock was the heart of the port's tobacco trade. © PLA collection. Wines and spirits were imported into the London docks in barrels. 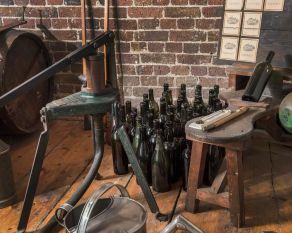 Specialist bottling facilities including labelling, corking and fitting foil to the top of the bottles. 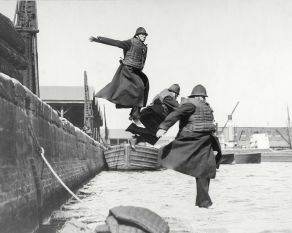 These members of the Port of London police force were undertaking their annual life-saving practice at the West India Docks. © PLA collection. Customs officers had to check all the goods unloaded on the docks to levy the appropriate import duty. They worked from sheds like this one, built inside the quayside warehouses. This figure of a "Turkoman"- meaning someone from Turkey- stood outside a London shop, stood outside a London grocer’s shop, advertising coffee imported from Turkey. This is a dock sample cabinet with an amazing variety of different commodities. If a stray cargo was dropped on the quayside, the sample cabinet would be used to identify the commodity. 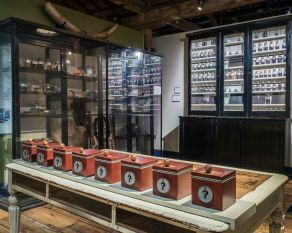 London imported a bewildering variety of objects. Can you identify some of them by scent alone? 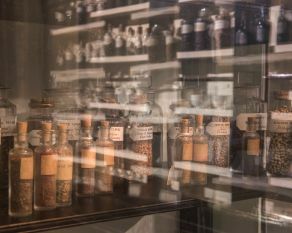 Look out for spices, woods, tobacco and tar. 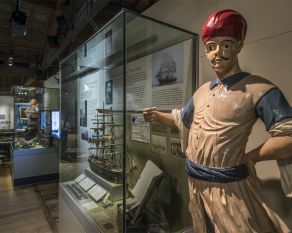 Tours, displays and handling sessions mean there's always something to do at Docklands. 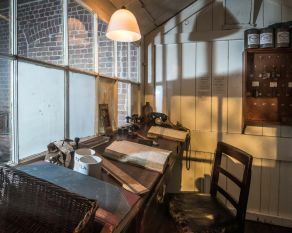 Find out about venue hire at the Museum of London Docklands. The Port and River archive tracks the history of London's docks.